Are you looking for a job where you can apply your passion and skills as a professional and devoted caregiver? Referred caregivers make a difference in the lives of our clients and our clients’ families. If you are like most AmeriCare referred caregivers, you can empathize with what families are going through. Chances are you have had personal experience with a loved one who needed care. You know what that feels like and what compassionate and competent help really means. If caregiving is your passion, we would love to meet you! You negotiate with your client your own rate of compensation. You control your own schedule and location of work which gives you more flexibility and satisfaction. 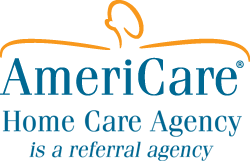 AmeriCare Home Care Agency is committed to making every effort to refer an assignment that fits into your requested preferences. You retain client consistency. Once a client selects you as their referred caregiver, you remain with that client until you or the client choose to make any changes. This arrangement makes for a better relationship between you and your client. Face-to-face meeting with the Caregiver to become familiar with their experience and skills. Personalized screening system including a criminal and driving record check. Verification of previous employment, state certifications and reference checks. If you would like to be placed on our caregiver registry, please complete our Caregiver Information Form below to get started.